Razer shoes are crafted with a uniquely formulated tempered tool steel, allowing the shoe to flex with natural hoof movement. Razerhorse has manufactured Razer shoes to include flexibility among the many unique features and benefits. It has a low profile design with a narrow outer rim that sinks into the ground’s surface. This gives the frog and sole contact while following the movements of the hoof capsule, allowing a natural feel. A bold rounded toe gives a smooth slide upon landing while the rounded rim was added to enhance traction reducing stress to joints. 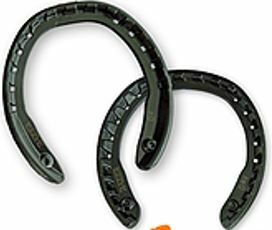 The light-weight, low profile design also brings an added health benefit by reducing the distance for the frog-to-ground contact when shod and less weight on the hoof while offering the protection of a steel shoe.